Nothing quite matches the sound of a rich acoustic guitar. 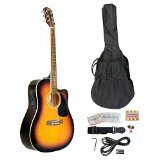 Now you can play one too with the PGAKT40SB, a 41′ acoustic-electric guitar from Pyle Pro that’s sounds great by itself or plugged into an amp. The electric pre-amp includes treble, mid, and bass controls, to get the exact sound you need. It’s got that cutaway look you’ve come to love from your favorite acoustic guitar players. And it’s constructed from high quality materials: spruce laminate for the top, linden laminate for the back and sides, and rosewood for the fingerboard and bridge. 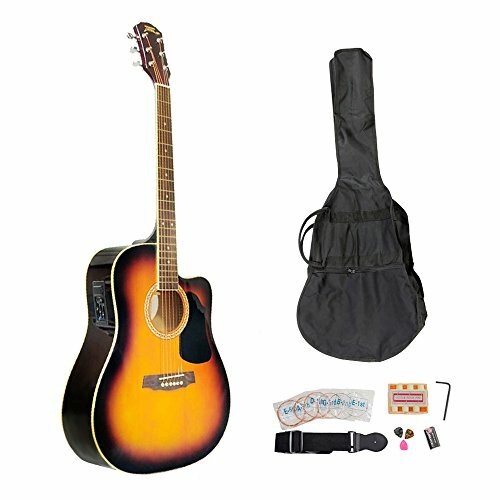 Plus, this guitar comes with a full set of accessories to match: a guitar strap, strings, carrying case, pitch pipe, and picks. Color: sunburst.